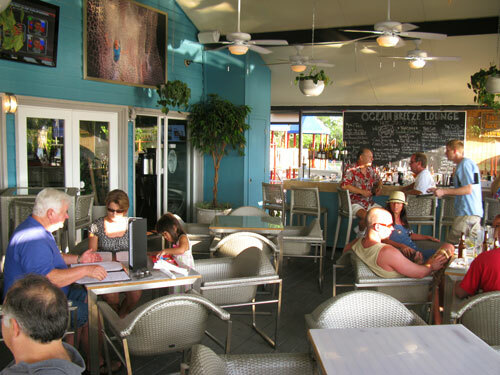 The Ocean Breeze Restaurant, just east of Blind Pass Bridge on St Pete Beach, is an upscale restaurant featuring tapas cuisine. 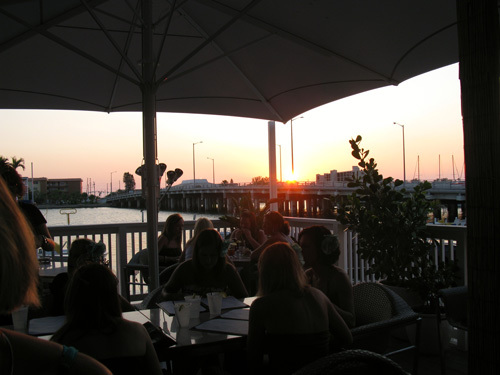 Located on the Intercoastal Waterway, diners get great food, cool breezes, and a view. 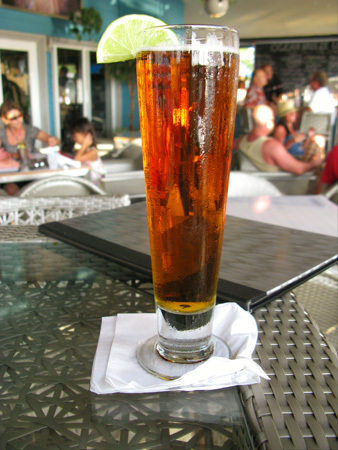 The Ocean Breeze is the same location as the former "Mulligan's Bar," but has undergone some radical changes. What used to be a casual beach bar, where guys pulled up in boats after a full day of fishing, has now given way to clients who wear linen shirts and sports coats. 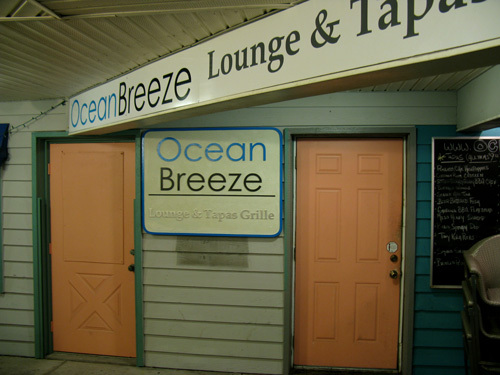 The Ocean Breeze Lounge sits right across the street from Sea Hags Bar and about a quarter of a mile east (across Blind Pass Bridge) from Captain Kosmakos on Treasure Island FL. The address is: 9524 Blind Pass Rd. - St Pete Beach, FL 33706. 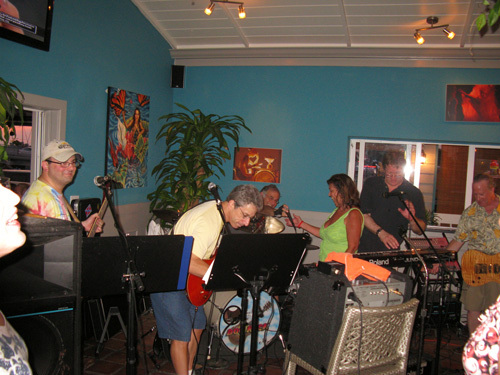 Phone (727) 360-1380 for more information or reservations. The Ocean Breeze Lounge walkway provides an immediate view to the Intercoastal Waterway that is spanned by Blind Pass Bridge. Although the inside area is beautiful, many locals prefer the outside patio seating. 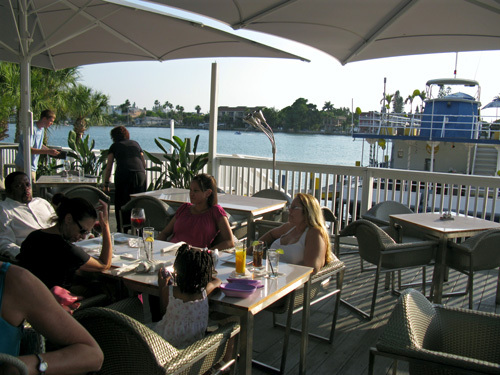 The Intercoastal Waterway runs directly behind the Ocean Breeze Restaurant and boats bringing diners still dock out back. 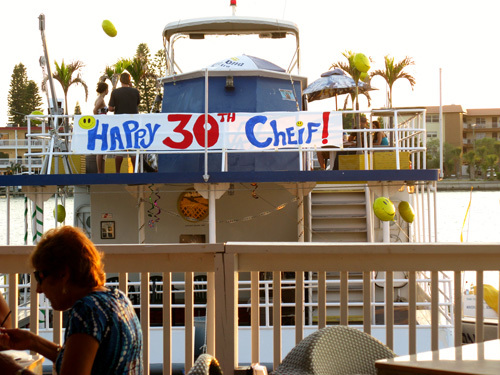 There was a birthday party going on aboard a rented boat out back. We hope the festivities were a bit better than the spelling. Although sunsets over Blind Pass Bridge are not near as dramatic as they are from the beach (about a 1/2 mile to the west) the Ocean Breeze can still provide a romantic element. The night we were here, the band Doc Rock was playing. Their selection includes mostly hits from the 60's and 70's. 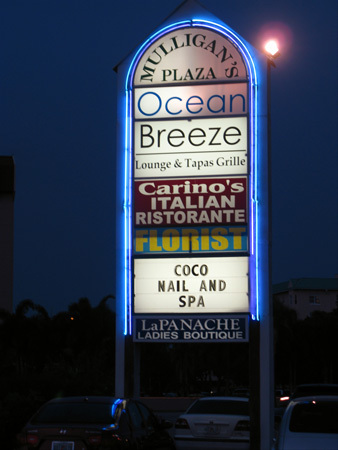 Like I said, things have changed to more upscale at the Ocean Breeze Restaurant. The new owner, Hans Koller, has worked hard to change the image from seaside casual to seaside chic. The place has been more crowded each time we have been there, so word is getting out. 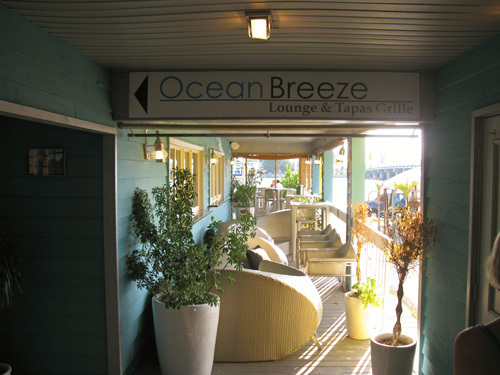 Could you become a travel writer and review nice restaurants like the Ocean Breeze?